Firstly, who has to have a contractor license? air conditioning and refrigeration work. (c) the repairing, renovation, decoration or protective treatment of a dwelling. A “dwelling” refers to a premises that someone lives in including houses, units and common areas to residential buildings. So for the purposes of fire safety upgrades or fire safety maintenance this means acontractor license is required for all electrical and plumbing work and any other work with a contract value > $1,000. What licence should the contractor have? This is where you have to dig a little deeper. A contractor licence on a letterhead or business card doesn’t necessarily mean everything is all above board. Importantly, the category of licence must match the type of work being carried out. Note the distinction between “contractor” and “builder”. There are specific classes of contractor licence with a limited scope OR there is a builder class of licence which encompasses all types of work. It is surprising how many licenced contractors are working outside of their licence class e.g. plumbers and electricians doing building works, minor maintenance contractors doing carpentry work etc. Follow the prompts and enter in the name of the person/company you wish to check. Click on the company name to get a full description of the licencee. The licence class must match up with the work being undertaken or it must state “Builder” (which encompasses all licence classes). 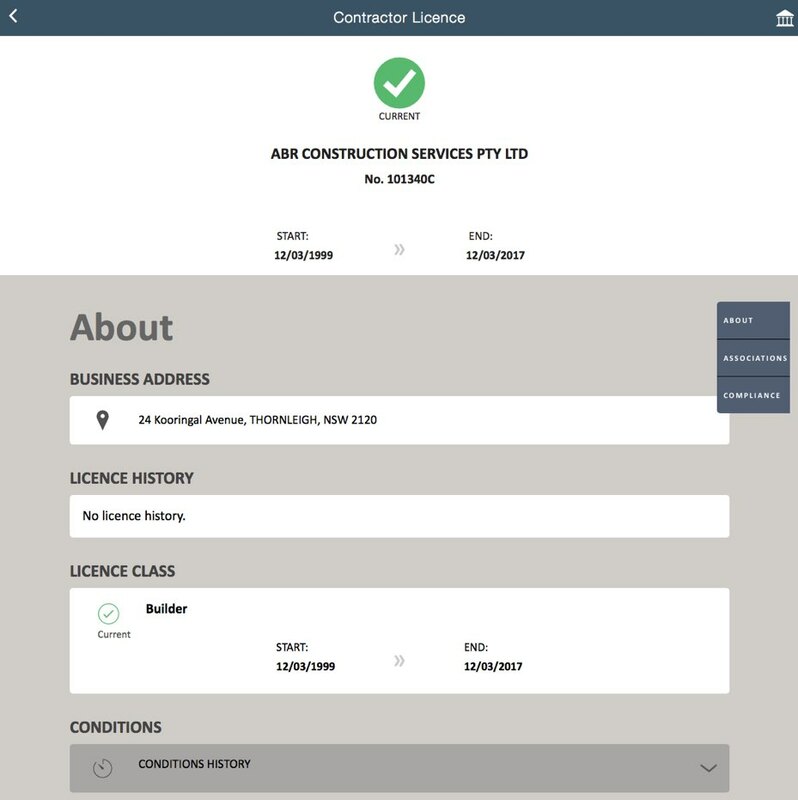 The example below shows our unrestricted Builder licence with no conditions.